Deep underground, hidden away from the reality above, lies a very special school. Set in a serene, natural backdrop, young women strive to unlock the power of the inner mind. This is E.Y.E.S. Eve Doorson had been at E.Y.E.S. for 2 years, and she had no knowledge of what had happened to her before then nor what lay beyond the school. That all changed when Dew appeared. That contact with the real world opened her mind to what lay out there. Now, Dew needs Eve to follow her to the city. She is needed...and quickly. Time is rapidly running out for everyone. The air and the water are going bad. Resources are dwindling, and so is hope. For a group of rebels who truly wish to save their city, they hope that Eve can reach out and find a solution from the past...before it's too late. E.Y.E.S. 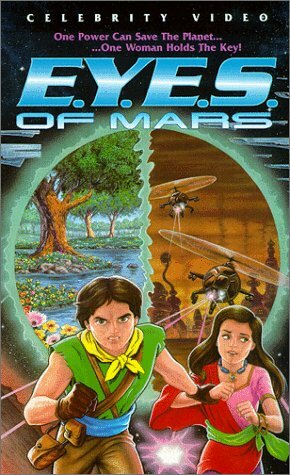 of Mars is one of the more elusive modern anime titles around. It carries an obvious and overt environmental theme, and it is dedicated to the next generation, so that others may look at themselves and try to change their ways. It is arguable whether such an obvious theme is truly necessary, and for some people, it detracts from its popularity. However, one can argue that when it comes to such an important issue as the environment and our continued survival, one should not tiptoe around and instead face the reality head-on.